Wish all my lovely friends a very Happy Christmas! Hope you all are enjoying the festival of togetherness and warmth of this season’s merriment with your near and dear ones. I have always thought of Christmas as a time when friends and family comes around to wrap the whole year with each other. This is a beautiful festival where so many emotions and innocence is attached. Adore the faith with which kids hang stockings to get gifts or the way they believe Santa comes home on Christmas night to reward if you are good. That is some innocence belief, which could only be a part of a kid’s wonderland. Love the midnight masses with the chorus carol welcoming Christ to bless us…there is some divinity that’s only associated with this festival. I believe in the words of Burton hillis, “The best of all gifts around any Christmas tree: the presence of a happy family all wrapped up in each other”. Christmas for me is the time to be kind, to be generous, to be forgiving and all in all a good time to open our hearts and look forward to new days with new optimism. Even in India, Surprisingly this is one of the times when we take out the time and soak all the happiness and festivities around. Winter being the most cherished season and with the two major holidays coming one after another it always give us a long time to enjoy. Come Christmas and everyone in Bengal would be ready to atleast go for one picnic…some manage to arrange it far away from home to a scenic spot and some choose their backyard banana field to cook and eat with extended families…but everyone joins in the gaiety, which is the very essence of this festival. 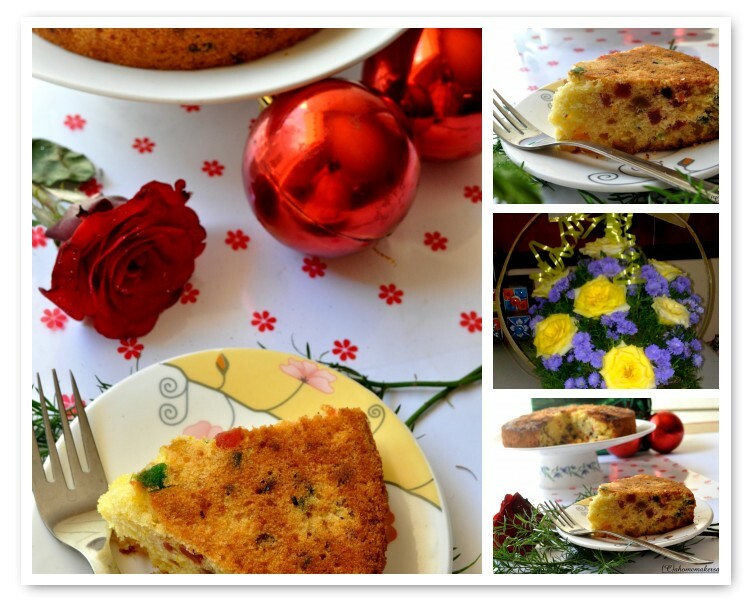 Christmas also is the time to eat fruit cake and the market is laden with so many varieties to choose from. From traditional rum soaked fruit and nut cake to less know Madeira cake, the spread on offer is huge. Last year I made the traditional fruit cake and this year wanted to do something different. Saw many a Dandee cake in the blogosphere and tweaked the recipe to have my own version of this Orange fruit cake. Hubby loved it so much that this evening when Baba called up the first thing he said was “T has made a superb fruit cake…”. Good to hear from a not so great lover of sweet things. Personally I love the crumbly texture and the dominating orange flavour. Cool on a wire rack and serve as it is or with some final sprinkling of castor sugar on top. I brushed the top of the hot cake with some homemade orange marmalade. This cake doesn’t rise much so don’t worry but make sure the cake is cooked from within. Always do the toothpick taste. 4. Dr.Sameena's Cookies and cakes for Christmas. Cakes, less egg cake, baked dessert, orange cake, tutti frutti cake, Papaya tid bits, papaya tid bits cake, citrus cake, dandee cake, christmas cake, fruit cake, traditional fruit cake, orange marmalade cake, fruit n nut cake, best orange cake, crumbly cake, double bite, fruit cake, vanilla, orange zest, lemon zest, milk, baked Christmas treat, christmas treat, best christmas cake recipe, easy cake, the easiest cake recipe ever. Orange flavored tutti fruit cake looks delicious. Nice clicks. Yummy cake sayantani!! !Merry Christmas to you!! what a lovely cake! love the snaps too..
lovely cake dear..and great click too..awesome..thx for ur sweets comments in my blog..glad to follow u!.hapi holidays! Lovely cake and nice pics. wonderful cake ... beautiful clicks ! Merry Christmas to you and your family dear. That is a lovely cake from your side and pics to kya kehne!! Good yaar keep it up. Used to be a treat for us! The cake looks lovely, like the citrus in it. Cant take my eyes from the clicks, soo delightful and gorgeous cake..
You had me at 'orange flavored' I love everything orange. Great recipe and hope you had a great Christmas. Wow so yummy fruitti cake..loved it. there is an award waiting at my place:) for you ! I love orange flavor in cakes and bakes! Tutti fruitti makes it double yumm, lovely cake... thanks for sending this to my event Sayantani. Nice pic..Drool..drool..looks so perfect and yummy!! Wowwwwwwww.. Mouth watering cake.. looks so soft and perfect.. beautiful presentation !! The orange flavor is a great addition.tutti frutti is always a yum addition to cakes!Hope u had a nice christmas! I find this simple yummy cake very tempting...Next kobe banacho janio ;-) chole ashbo. Awesome cake and loved ur photography!